Tonight, Carly came all the way from Corry to Erie to work with me. 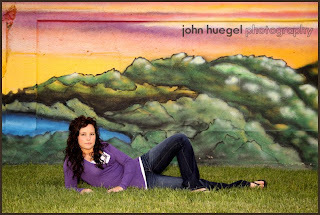 She had some very specific ideas, and wanted to experience the “John Huegel Photography” session. We had perfect weather for the outdoor portion. Not too hot, low winds and no rain. And a killer sunset to boot. One of her favorite shots is the partial color image where most of the photo is in black and white, but some color is retained. 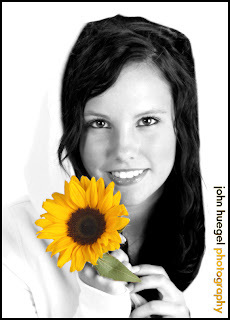 She brought a fresh sunflower and we took this image with the partial color finish in mind. We visited a number of my favorite locations in Erie, including the famous Mural Wall between Peach and Sassafras around 14th street. Here’s a great pose of Carly against that wall. Carly, you had many great images. Thanks for making the journey to Erie and choosing us for your Senior Portraits! This entry was posted in Partial Color, Senior by admin. Bookmark the permalink.